Posted by Brittany Bosher on Wednesday, April 19th, 2017 at 8:55pm. “Art After Dark” has earned a good reputation from its diverse collection of art ranging from paint to film, sculpture to fine dining and the list goes on. The event is where “culture and entertainment meet” many have said and its certainly one event you will want to experience. Guests of the program will take a journey into different forms of art. At one “Art After Dark” event you may be studying music, the next can be dance, and other times it will be about fine art, historical masterpieces or even fine wines. The Norton Museum of Art has done an exceptional job making sure each event offers something new and ventures into all the different kinds of art we can see in the world. Art After Dark runs from 5 to 9 p.m. every Thursday. Admission is half-price on Thursdays, normally $12 for adults, $5 for students, and free for members and children under 12 every day. Food and beverages are served from the museum's café, Fratelli Lyon, which offers an à la carte dinner menu from 5 to 8:30 p.m. The Norton Museum of Art is located at 1451 South Olive Avenue in West Palm Beach. 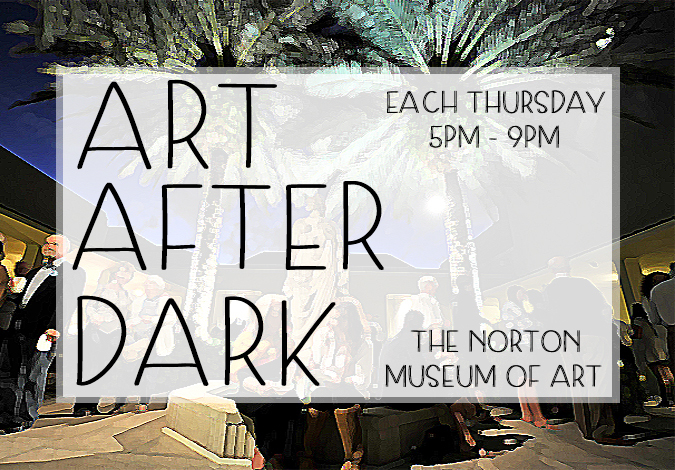 For more information about the upcoming “Art After Dark” please call 561-832-5196 or email info@norton.org.